Ulf Jonasson : Thoughts and reflections: After a few weeks of thinking, reading and writing, I am now ready to formulate some important questions / theses. I am Ulf Jonasson and I live - together with my wife Birgitta - in a small Swedish town – Katrineholm in Sörmland. Before we moved to this county we lived many years in Uppsala - where we were studying at the University of Uppsala. I got my Doctor´s degree in Public Health in 2001 at the Nordic School of Public Health in Gothenburg. After a few weeks of thinking, reading and writing, I am now ready to formulate some important questions / theses. I just got information from Scott about” the lost letters”, and he has now got the two doctoral dissertations and some more data – and given it to you. I was happy to hear that. I send you in this mail a summary of my work the last weeks, and there are some real good news. I used to be a journalist and I like to combine journalist and science. I also will send you tonight a few tweets and some important text. And some god pictures-Look forward hearing from you. 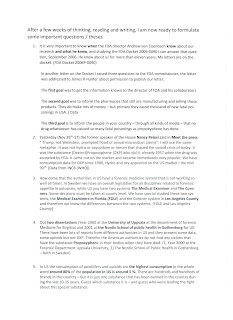 It is very important to know when the FDA director Andrew von Eisenbach know about our research and what he knew, and studying the FDA Docket 2006-0090 I can answer that question, it was in September 2006. He knew or should have known about our research and the letter I wrote to this docket since 2006, more than eleven years. My letters are on the docket. (FDA Docket 2006P-0090). 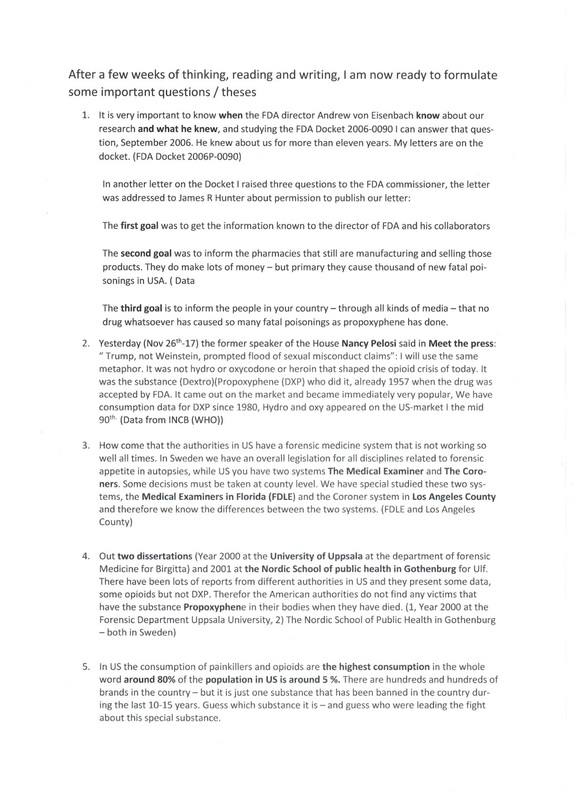 The first goal was to get the information known to the director of FDA and his collaborators. The second goal was to inform the pharmacies that still are manufacturing and selling those products, Eli Lilly. They do make lots of money – but primary they cause thousands of new fatal poisonings in USA. The third goal is to inform the people in your country – through all kinds of media – that no drug whatsoever has caused so many fatal poisonings as propoxyphene has done. How come that the authorities in US have a forensic medicine system that is not working so well all times. In Sweden we have an overall legislation for all disciplines related to forensic appetite in autopsies, while US you have two different systems The Medical Examiner and The Coroner System. Some decisions must be taken at county level, there are around 3 150 counties in US. We have special-studied these two systems, the Medical Examiners in Florida (FDLE) and the Coroner System in Los Angeles County and therefore we know the differences between the two systems. (FDLE and Los Angeles County) - and we are able to compare these data with the Swedish data. Our two dissertations (Year 2000 at the University of Uppsala at the Department of Forensic Medicine for Birgitta) and 2001 at the Nordic School of public health in Gothenburg for Ulf. There have been lots of reports from different authorities in US and they present some data, some opioids but not DXP. Therefor the American authorities do not find any victims that have the substance Propoxyphene in their bodies when they have died. We have studied these questions and have very good data – as a matter of fact unique data - from 2001- 2010 We have analyzed these data from different point of views. There is one well known painkiller in the US that is banned, and has been since November 19th 2010. US has the highest consumption of opioids – around 80% and US population is around 5 % - in the world. We think this has been a night-mare for the American people since the late 50th.